Its officially the worst July registration period since 2014 with new car sales down to 25,170, but it’s not really all doom and gloom for the Motor Trade, is it? Since dual registration was introduced in 2013 July has become like “January mark II” for the Motor Trade. Well, the July new car registration madness is over and the official tallies of sales are in showing it was the worst July on record since 2014. Not only that, but total new car registrations have dropped by 11.4% Year on Year since 2016. Meanwhile the news for the Motor Trade when it comes to used car sales is not as bad, as Used Car Sales continue to increased buoyed by a large increases in Used Vehicles imported from the UK. Used cars imported from the UK, and further afield, have increased by almost 40%, with over 53,000 used imported cars being registered since January the 1st 2017. The effects of Brexit on the exchange rate has certainly fueled this increase, and the change in the emissions tax regime in the UK means that there will be lots more cheap Diesel cars on the market in the UK in the very near future as both dealers and the public look to offload their Diesels. 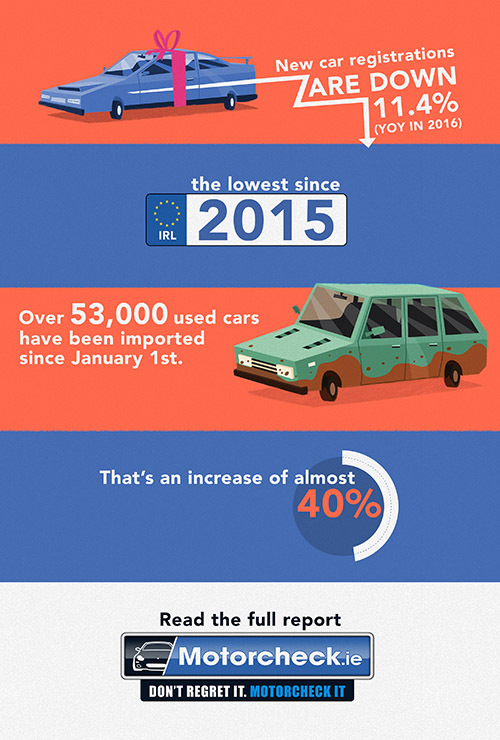 We’ve compiled a fully comprehensive report on new and used car imports right up to the end of January which can be viewed below or downloaded in PDF format. New Car Sales soar but does Brexit spell doom for the Irish Motor Trade?